In the Kingdom of France, no region excluded, no woman in the 18th century could be appointed a master silversmith. However, many wives of master silversmiths were themselves daughters of silversmiths and participated in the day-to-day management of the workshop alongside their husbands. If they rarely practiced the trade, at the least they were cognizant of the techniques, the accounts, and/or the relationships with the clientele. The premature death of the husband was a dramatic event for his widow who was likely to lose any immediate source of income. According to the regulations of the silversmiths' guilds (the "jurandes") the punches of the deceased husband had to be destroyed to prevent the illegal practice of the profession. The workshop was doomed to disappear, unless its continuation by the silversmith's widow was tolerated. Such tolerance, as one will see, was generally at a low level. In any case, even when the widow received permission to continue the business of the deceased husband, she couldn't become a full member of the silversmiths' guild (the "jurandes"). She wasn't allowed to assist in members' assemblies nor participate in the election of the wardens charged with overseeing the ethics of the profession. A widow who received permission to continue the trade of silversmith was obliged to adopt a new punch. This article describes the punches of widows. It is striking to note the close correlation between the level of tolerance accorded to widows in the exercise of the profession and the nature of the punches imposed upon them. 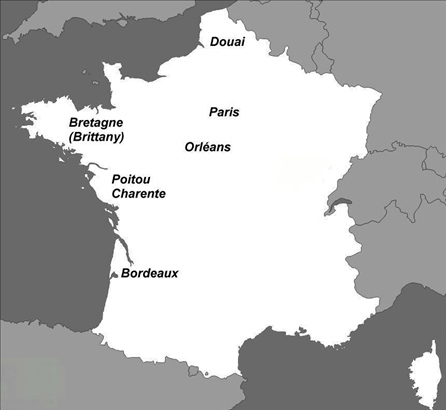 Below, are examples from the towns of Paris, Bordeaux, Orleans and Douai, and the regions of Brittany and Poitou Charente. In summary, one can distinguish within the kingdom three levels of permissiveness relating to the practice of the craft by silversmiths' widows. It is striking to note the correlation between the degree of tolerance afforded to widows in the occupation and even the nature of the punches imposed upon them. The V means of course "Veuve de..." (Widow of ...), followed by the initial (or the initials) of the dead master (the first letter of his surname or the initials of his surname and first name in this order). Seldom, the letter V followed the initials of the deceased rather than preceding them. ... and also in the major towns of northern France like ARRAS or LILLE. The tolerance towards the practice of the craft by widows was low. More than 150 silversmiths' punches have been identified between 1650 and 1791 in Douai, of which only three punches were assigned to widows. These punches correspond perfectly to the model above. VB Widow of Marc Antoine BROUX: Mark = VB crowned, entered c.1739 . VD Widow of Edouard DERUELLE: Mark = VD crowned, entered in 1790 . ...and also in AGEN, the second city of silversmithery in the region of Bordeaux, permission to practice given to widows was very late and very limited. The first punch of a widow was recorded only in 1743. Moreover, the punch took, in 1762, the mandatory form of the deceased silversmith's initial, surmounted in Bordeaux by a star; simply crowned in Agen. Six widows are duly recorded in Bordeaux and two in Agen. VD Catherine POMSER, widow of Jean DEPAU, registered in 1772 . VR Marie Colombe MAURIN, widow of Pierre RIEUX, registered in 1775 . Mark = VD under a star, over two dots (points) . Two marks, one for large items, another one for small items . Mark = VP under a star, over two dots (points) . VS Widow of Pierre SICARD: Mark = VS under a star, over two dots (points) . Mark = V crowned over LL, two dots (points) in the lower point . ... the capital of the kingdom, is obviously one of the least accessible cities for the workshops of widows. The number of the Parisian goldsmiths is considerable; more than 2000 goldsmiths operated within Paris during the 17th and 18th centuries. On the other hand, only one widow (!) can be listed as having practiced with a personal punch in this city. Certain other widows would have received the authorization to practice, but without a punch. VAL Louise LEMASSON, widow Antoine LAMBERT, enrolled at MANTES in 1775 . VTM Angélique PENON, widow of Thomas MASSÉ, VERSAILLES 1763 . VTT Suzanne VINDÉ, widow of Thomas TESTU, SENLIS 1757 . PMBV Marie Anne BÉRANGER, widow of Pierre Michel BESNARD, SENS 1760 . ...of which the capital is NANTES, one, however, observes a rather high number of widows who had received permission to practice. 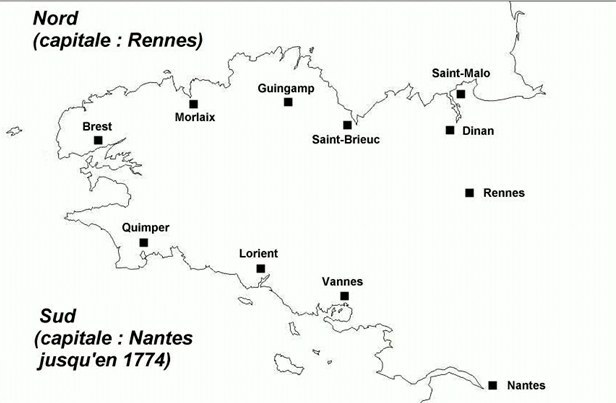 This administrative region ("Généralité") which covered the south of Brittany, from Nantes to Quimper (see map on the right) was eliminated in 1774, and conjoined to the town of Rennes to make up a larger Brittany. Nevertheless, whatever the period, the punches of widows were struck according to the principle of retaining only the initials of the dead husband, thus differing from the practices of North Brittany where the use of the initials of the maiden name of the widow prevails. Mark = letters VB crowned over an ermine . Mark = VC crowned over A . Mark unknown, described as "letters VG crowned" . Mark = letters VeH over an ermine . Mark = (V dot [point] L) crowned over "fleur de lys the lower point" . Mark described as: "VL crowned, D at the lower point next to 2 fleurs de lys" . Registered in Nantes in 1740, Mark unknown . Finally, it's interesting to quote the case of Perrine Corentine THÉBAULT, widow of Jacques SOLLIER, who illegally retained the punch (IS) of her husband, who died in 1701. This is not a rare example. Many widows, some of them mentioned above, could have used this stratagem to maintain the possibility of continuing the work of the deceased husband. ...... whose main town is Rennes which, in 1774, became the regional capital of all of Brittany. In this town the rules dealing with a widow's punch were differed from those used in southern Brittany towns. Possibly, she retained her husband's punch! Her Mark is registered in Brest in 1753. She died in 1764 . APV Anne Hélène PIERRE, widow of Joseph LUCAS. For three years she continued to use the punch of her deceased husband. Her widow's mark was registered in Saint-Pol de Léon in 1739: (A ermine P) crowned over V .
Mark = EJ under "fleur de lys" crowned, over a small ermine and V .
Mark = (G ermine P) under a "fleur de lys" crowned, V .
Mark attributed = (J small ermine G) under a "fleur de lys" crowned, V .
Mark = MG, small ermine, "fleur de lys" crowned, V .
Mark = (M ermine N) under a "fleur de lys" crowned, V .
She maintains the punch of her deceased husband (1729), before registering her widow's punch in 1740 in Rennes. Mark attributed: (M ermine S) "fleur de lys" crowned, V .
PFV Angélique COQUART, widow of Guy PELLÉ des FORGES. The punch (unknown) is described, on the official registration at Moriaix, in 1786, as having the initials of the deceased husband. The reason supporting the registration of such a punch is unknown to me. .
Also, in the bibliography, the situation is presented of Jeanne Marguerite NOYER, widow of Paul André CHAMBART in Brest, who registered her punch in 1782. The punch allotted to her contained the letters IMV, corresponding, presumably, to the use of only the initials of her first two names ("I" for Jeanne "M" for Marguerite, and "V" for "Veuve -widow-"). In the examples which follow, it is not a question of speaking of feminism but, perhaps, quite simply a normal recognition of the performance of the widows in an art craft in which artistic sensitivity and taste play a role undoubtedly as important as physical strength and exactitude. Not only did the widows continue, without a problem, the work of their deceased husbands, but even more they obtained the right to use a punch utilizing only the initials of their maiden name, without the letter V to allude to their widowhood. The mark of a widow thus took a form analogous to t hat of any other silversmith. ... the silversmiths' guild had an average of 20 active masters in the late 17th century. This figure had a slow decline during the 18th century (15 silversmiths are identified in 1789). Thus the following, non-exhaustive, directory of silversmiths' widows in Orleans is not negligible. It seems that, in the late 18th century, the practice of using the widow's maiden name in the punch was disregarded. However, this measure wasn't mandatory and can be considered as a deliberate choice of the widows concerned. Mark = CF crowned over a "coeur de lys"
(A cœur de lys is a fleur de lys viewed from the top - it is the traditional symbol of the gold and silversmiths of Orleans) . Mark = FF crowned over a "coeur de lys"
Mark = MH under a "fleur de lys" crowned, over a "coeur de lys" . Mark = ML intertwined on a crescent, under a star and a "coeur de lys" . Mark = (M.L) under a crowned torch, over V .
Mark attributed = MY crowned over a "coeur de lys" . Mark = letters VD crowned over a dot (point) . 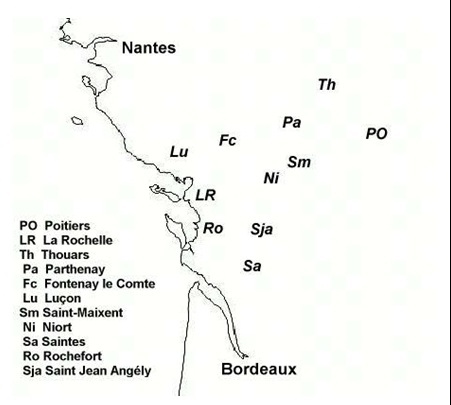 ... a region comprised of two administrative areas with POITIERS and LA ROCHELLE as capitals, bordered to the north by Brittany, to the south by the Aquitaine and to the west by the Atlantic Ocean. The tolerance extended to silversmiths' widows is undoubtedly the most benevolent of the whole kingdom of France. Their total number is impressive. DM Madeleine DECERISIÈRES, widow of Pierre Renoust Thouars 1780 c.
Heraldic and monarchical symbols were the preferred motifs used in their marks by male and female silversmiths of Poitou Charente. The variety of typology in the punches used by silversmiths' widows tightly reflects the different treatment accorded to their entrance to the profession. The comparison between towns and regions, even fairly close to each other, demonstrates the extreme variability of the level of tolerance characterizing the Kingdom of France in the 18th century.